The game of hockey is all about streaking. No, I’m not talking about Will Ferrell running down the street in his birthday suit a la “Old School”; I’m talking players and teams doing good or bad things for a consecutive period of time. Whenever we analyze or preview a game we talk about who’s on scoring streaks which teams are winning and which teams are losing. These streaks dominate our fantasy pools, for better or worse, and allow the casual fan to determine who is playing well and who isn’t. 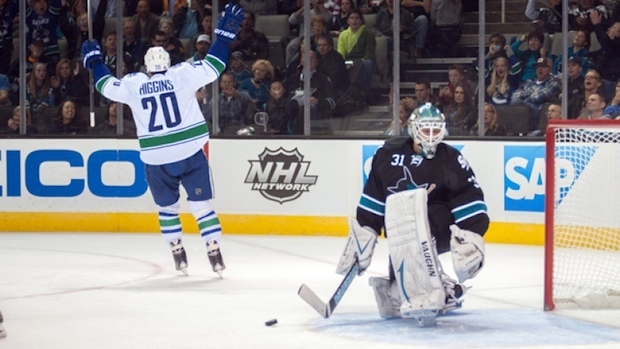 Last Thursday, the Canucks snapped a 9-game losing streak (excluding pre-season) to the San Jose Sharks. They played a confident and complete game, getting contributions from players not named Sedin or Kesler – secondary scoring – and handed the Sharks a rare loss in the mighty “Shark Tank”. They’ve had their hand in other streaks, some great, others downright depressing. 5) Alex Burrows (2012) – During the 2011/2012 NHL season, the Detroit Red Wings had put together a miraculous streak of 23 wins in a row at home. The Canucks were itching to end the streak even stating to the media that they hoped the Red Wings kept winning so they could take a crack at them. The game ended up going to a shootout where Alex Burrows pulled off his signature backhand deke to complete the epic barn-burner. 4) Harold Druken (2001) – The Canucks had not made the playoffs in 4 years and were desperate to get back to the big dance. With a young core and some promising leadership, they managed to put themselves in a position to clinch the 8th and final playoff spot. Unsung hero Harold Druken provided the dramatics in overtime against the Los Angeles Kings. 3) Roberto Luongo (2008) – Lu showed us why he made the big bucks with this franchise record shutout streak in November of 2008. He strung together nearly 243 minutes of shutout hockey, and if not for injuries, would have surely been in contention for the Vezina. 2) Alex Burrows (2009) – This shorthanded goal from Alex Burrows ushered in the new era of Canuck dominance and effectively snapped an 8-game losing streak. Never has a team been more relieved to beat the Carolina Hurricanes in regular season play. 1) Alex Burrows (2011) – Yes, another Alex Burrows goal. Apparently this guy is clutch. This goal ended an era of Chicago Blackhawks playoff dominance over the Canucks and set the stage for a long playoff run that brought us within one game of the Stanley Cup. Burrows picks off a pass in overtime of game 7 and blasts one home to avoid 3 straight years of playoff defeat to the Blackhawks. I had the fortune to be at the game where Druken scored that goal. The barn was rocking like nothing before that night. So freakin’ loud!